(P.S. : Were you channeling Sally? .....is a really easy mark. "Aw, I didn't get you a Christmas present." "That's OK, how about giving me a trip to Europe instead?" Gosh, Reed, why not just throw in a new Lexus while you're at it? Also, keep in mind that kindly old "Mister Masters", the object of Reed's vast generosity, is someone who has repeatedly tried to kill him. Friday Night Fights: Fight Life - Round 3 - Have Yourself A Haney Christmas! It's time for another installment of Friday Night Fights: Fight Life! 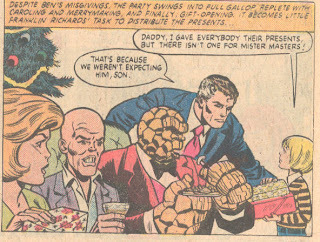 Our host, Spacebooger, has informed us that this is the last FNF round before Christmas, so I'm using this round to deliver some groovy holiday cheer, Bob Haney style! 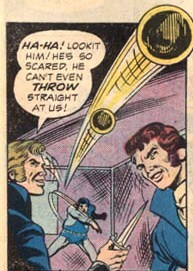 Tonight's Dickensian donnybrook comes from Teen Titans#13, "The TT's Swingin' Christmas Carol! ", written by crazy ol' Bob Haney and illustrated by Nick Cardy. Synopsis: Greedy junk dealer Ebeneezer Scrounge sends his employee Bob Ratchet home early. Unbeknownst to Ratchet, his wheelchair-bound son Tiny Tom has decided to pay his dad a surprise visit at work. He misses but arrives just in time to witness Scrounge colllaborating with a smuggler named "Mr. Big". Tom tells his dad, but when Bob confronts Scrounge, Scrounge makes Ratchet work Christmas Day to keep an eye on him. At that point, Tiny Tom calls in the Teen Titans. After the Titans save Ebeneezer from being killed by his escaped convict partner, Jacob Farley, Robin, being the genius that he is, sees the obvious parallels and decides to have the Titans pose as the three ghosts to scare the "Dickens" into Scrounge and make him change his ways. Here the Titans are taking down Mr. Big and his goons. Or trying to. Surely, the Fastest Teen Alive can save the day, right? Wrong! And don't call me "Shirley". "Wonder Chick" to the rescue! Or not. After seeing the thugs trash Tiny Tom's wheelchair, Scrounge has had enough. But what about Tiny Tom? That wraps things up! And speaking of wrapping, tonight's fight music is "Christmas Wrapping" by the Waitresses. For more seasonal slugfests, click here. And give the gift of votes! Merry Christmas to all, and to all a good fight! Friday Night Fights: Fight Life! - Round 2: He's Got Big Balls! 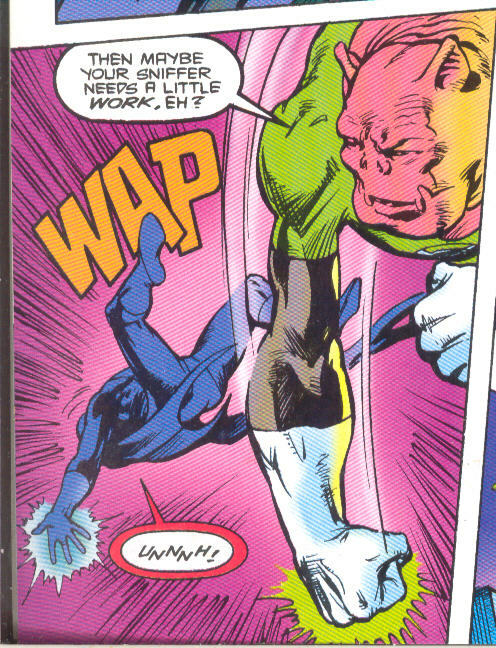 I won Round One of Friday Night Fights: Fight Life last week with my Tasmanian Devil entry, so tradition dictates that I follow up this week with a Legion Of Super-Heroes related entry. 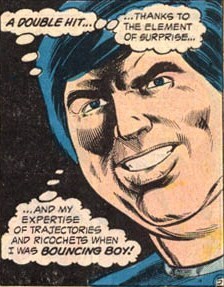 This time I'm showcasing a severely underrated Legionnaire, one I've never used before: Chuck Taine aka Bouncing Boy! Tonight's bouncing brouhaha comes from Superboy#216 (the same issue which introduced "fan-favorite" Tyroc), in a backup story written by Cary Bates and drawn by Mike Grell. Synopsis: Bouncing Boy and his wife, Duo Damsel, are relaxing at a park when Chuck gets harrassed by a street gang that he had put behind bars earlier. This story was set during a period where Chuck had lost his bouncing powers, so Duo Damsel comes to his aid and drives off the gangbangers. Unfortunately, she also gets drugged in the process after one of the thugs nicks her with his spiked ring, causing her to collapse, just in time for the gang to come back for revenge. Here, Bouncing Boy carries an unconscious Duo Damsel into one of the park's athletic courts to make his final stand. 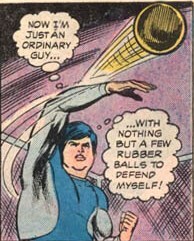 While Chuck doesn't have powers, he's still got balls. Literally. 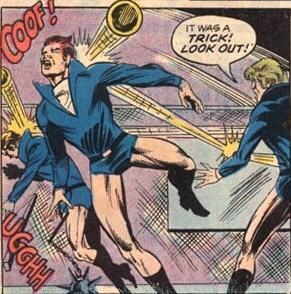 You have to give Mike Grell credit for being fair-minded. 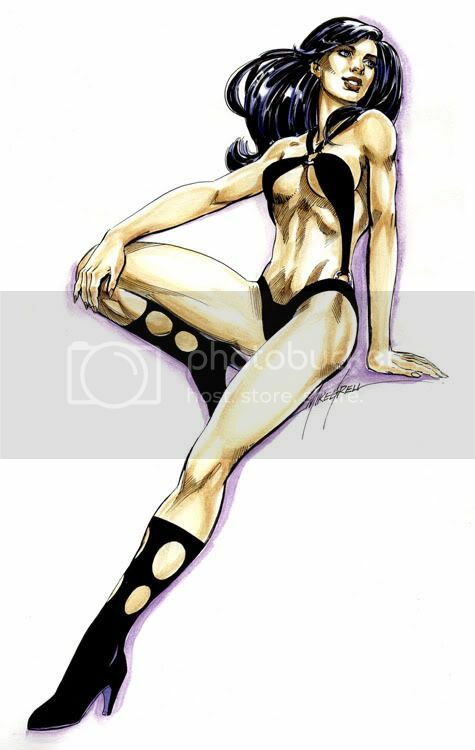 While he has drawn his share of scantily-clad females over the course of his career, he's never been shy about drawing scantily-clad males as well . Notice the street gang's outfits, which were clearly inspired by 21st Century Nevada law enforcement officer Jim Dangle. Remember those two rubber balls that Chuck ...uhhh... chucked at the gang members a few panels ago? Oh, that's how. Well, if he ever decides to give up on being a Legionnaire, he's got a promising career as a pool shark! Tonight's fight music is "Big Balls" by Australian rockers AC/DC. For more ballsy brawls, click here. And don't forget to use your special super-power: Voting! 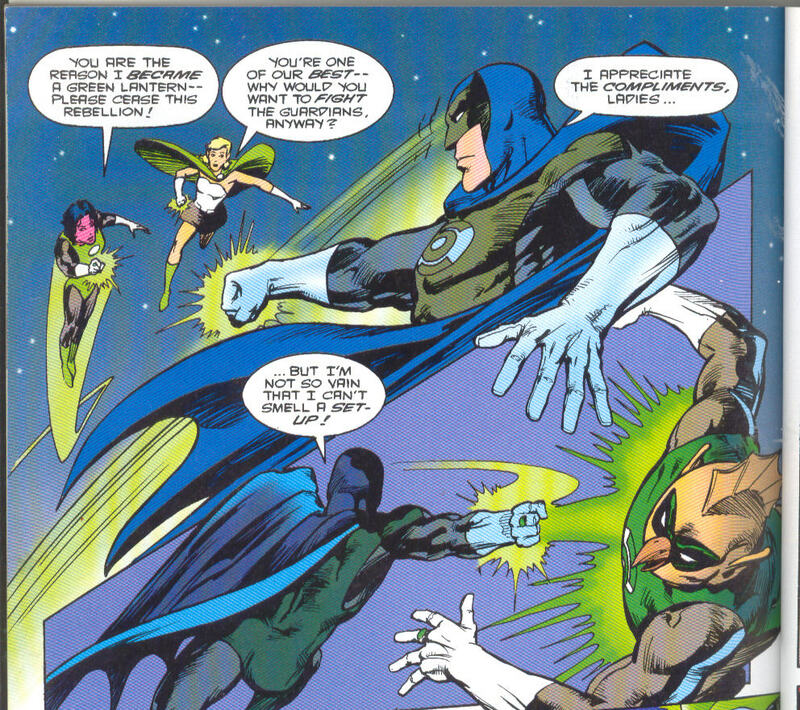 Whack a Lantern Week: Rarities! Welcome again to "Whack a Lantern Week". This past Thursday on my blog, Sally P observed how rare it is to find panels of John Stewart and Alan Scott getting whacked. Well, as far as rare GL whackings go, I think I can go two better. When DC killed off Ryan(TheAtom) Choi in the Titans: Villains for Hire one-shot, they pissed off a lot of Ryan fans. And who can blame them? 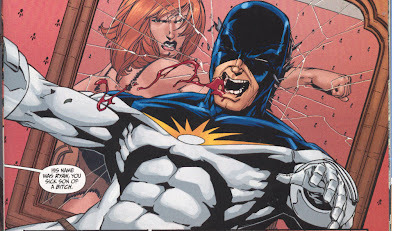 Ryan was unceremoniously stabbed in the chest by Slade Wilson aka Deathstroke to showcase his new team. 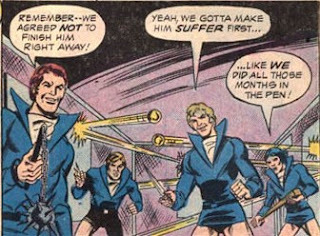 Then, to add more insult, Ryan's corpse was shrunken, stuffed into a matchbox, and delivered to Dwarfstar, the sadistic size-changing serial killer who had hired Slade's team. Corpse and matchbox are presumably still in Dwarfstar's possession. So you can see why fans would be angry. One of those angry fans was yours truly. 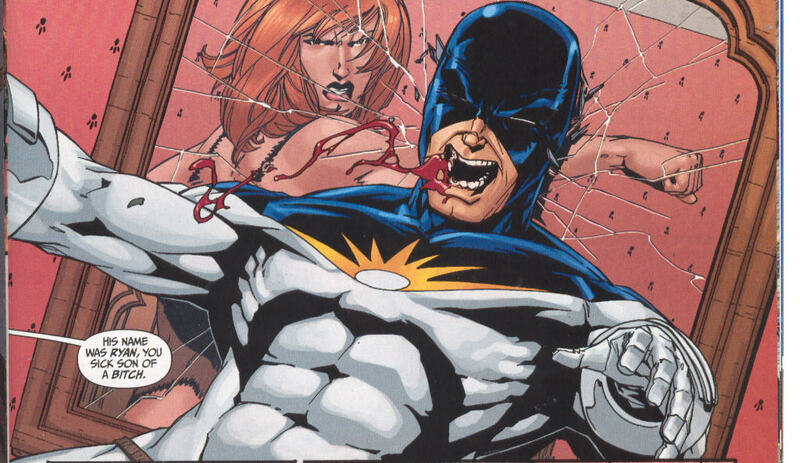 But another was clearly Gail Simone. but unlike the rest of us, Gail could vent her frustrations into DC canon. First, she wrote a self-contained Elseworlds-type tale in which the Six were characters in the Old West, and had to band together to square off against a band of marauders assembled by the Old West version of Ragdoll's sister. These marauders included a one-eyed mercenary named Slade. Here's what happened when Slade faced off against Deadshot and Bane. But that was just Gail's warm-up. In the storyline prior to the Wild West story, Bane and Jeanette had assembled their new version of the Six, and included not only the aforementioned Dwarfstar but also Ryan's former girlfriend, Giganta. 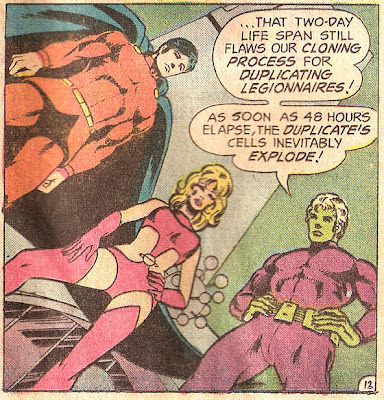 Giganta spends the next story arc unaware that Ryan is dead, or that Dwarfstar had him killed. Until someone whose name rhymes with "The Mall" tells her. The end of issue#28 is the result. And that's not even one of the good parts. Friday Night Fights: Fight Life! - Round 1: Whack a Lantern! Welcome to Round 1 of the latest Friday Night Fights bout, entitled "Fight Life". By sheer coincidence, Sally P has also declared this week to be "Whack a Lantern Week.". What to do? 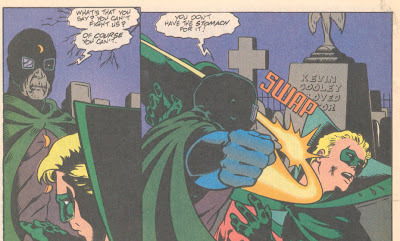 Answer: Showcase a GL smackdown featuring Guy Gardner! 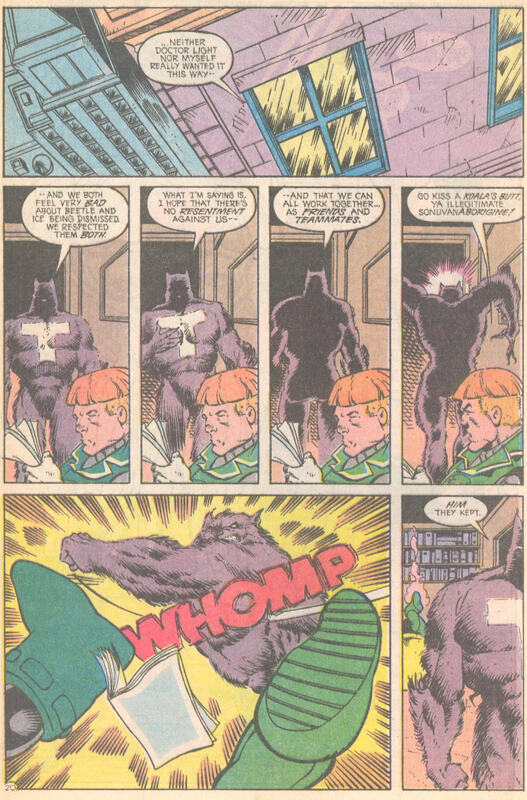 Tonight's emerald whomping﻿ comes from Justice League America#54, written by Keith Giffen and J.M. DeMatteis and illustrated by Chris Wozniak and Bob Smith. 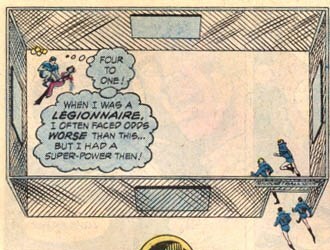 This was the part of the "Breakdowns" crossover in the Giffen League comics. Synopsis: Maxwell Lord has been shot. The U.N. appoints Ambassador Heimlich to be his acting replacement, and Heimlich's first maneuver is to fire Blue Beetle and Ice and replace them with Tasmanian Devil and Dr. Light (Kimiyo). Here, Taz introduces himself to Guy Gardner and expresses his regrets over Beetle's and Ice's dismissals. Guy, of course, reacts in his usual diplomatic fashion. ﻿Tonight's fight music is "Breakdown" by Tom Petty and the Heartbreakers. For more diplomatic displays, click here. And don't forget to vote! "Whack a Lantern Week" Continues! 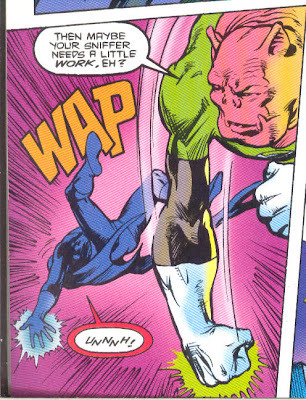 It's "Whack a Lantern Week", and so far I've seen whackings of Hal, Kyle, and Guy. But what about Alan Scott?